THE SIKH NUGGET: The soil of Nankana Sahib helps create Sikh paintings. The soil of Nankana Sahib helps create Sikh paintings. AMRITSAR: It took Bholla Javed months of hard work to complete oil painting of first Sikh master Guru Nanak Dev. Bholla has used soil from Nankana Sahib, Guru Nanak's birthplace, and bamboo shoots from trees grown there. The artist has also made a painting of Bhagat Singh, using soil from the freedom fighter's birthplace at Chak Banga in Pakistan. Bholla is keen that his paintings of Guru Nanak Dev and Bhagat Singh be displayed at the Sikh museum. 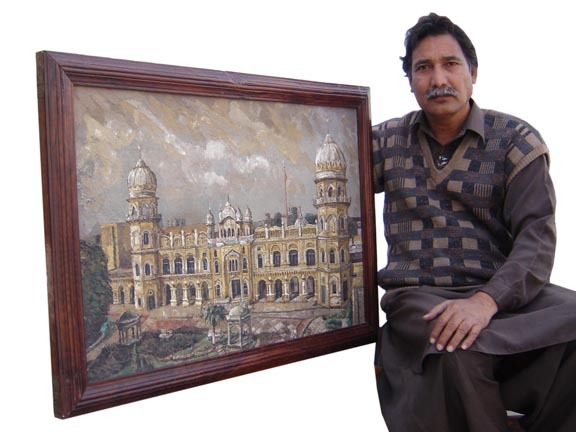 Swaran Singh, president of Nankana Sahib Sikh Teerath Yatree Jatha, who brought the photographs of the two paintings to India, told TOI on Sunday that Bholla had brought a 4 by 2.5 feet painting of Guru Nanak Dev at Gurdwara Dera Sahib, Lahore, to show it to the devotees and the officials of Evacuee Trust Property Board (ETPB). 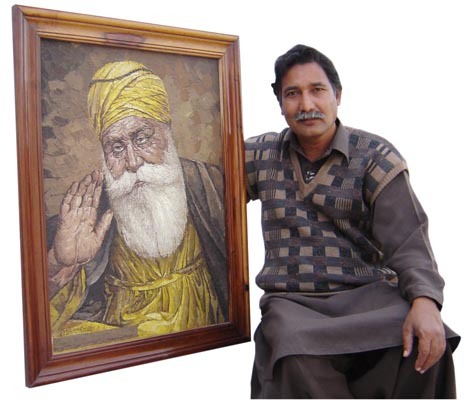 Bholla has not only made the paintings of Guru Nanak Dev using soil from Nankana Sahib but also not used any brush, he said. 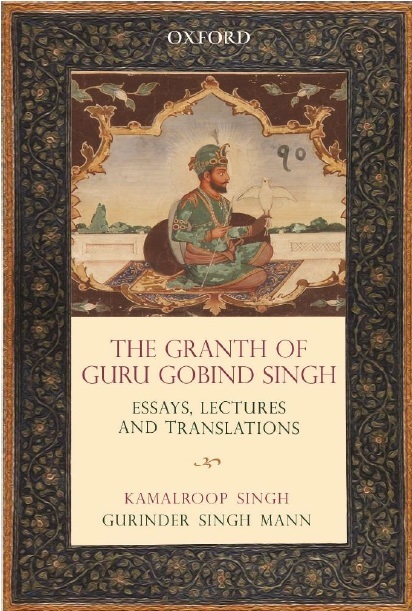 "Instead, he has used small branches and bamboo shoots from the trees planted in the birth place of Guru Nanak to make the soil paintings," he said. Even the frame of Guru Nanak's soil painting was made from the wood taken from a tree in Nankana Sahib, he added. A special technique is required to make soil paintings, said Bholla, who us a resident of Lyallpur in Faisalabad, Pakistan, was born in the family of a tailor and is the eldest of five brothers. "I got my education up to class 8 only. But with my paintings, I am now a member of several art societies, including MPSGS Art Society (USA), Australian Art Society and Royal Miniature Art Society (UK)," he said, adding that he was the first Pakistani artist to be a member of Hilliard Art Society in UK. "He (Bholla) said that he would visit India to talk to the SGPC authorities about displaying his painting," said Swaran.